12/01/2016 –Thecus Technology Corp in their latest ThecusOS 7.0 firmware update introduced Scale-Out functionality. The Scale-Out function allows for the volume capacity of a NAS infrastructure to be expanded dynamically across numerous independent Thecus NAS systems in the same network subnet. The architecture is designed to scale both capacity and performance, essentially without limit. businesses can avoid costly revamps from scratch to their data centers by simply adding additional NAS devices Essentially, one NAS, which acts as a client, can support a large amount of servers without a loss in performance. Since the individual NAS units are connected through a local network, the solution requires at least gigabit LAN bandwidth to work smoothly. Internet connection is possible, though limitations in regards to internet connectivity will hinder performance. 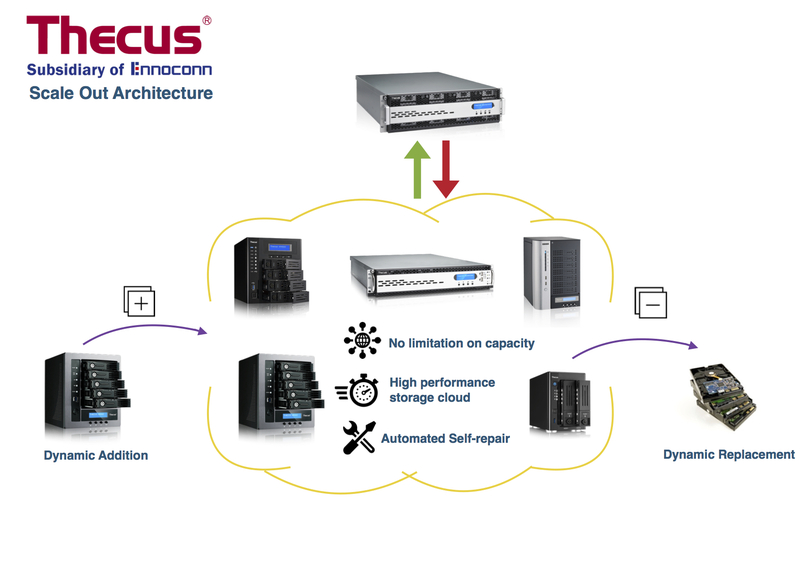 Thecus NAS systems, with native support or expandability to 10 GbE LAN speed can form exceptional high-performance storage pools with rock-solid resilience through Scale-Out. (10GbE expansion can be achieved with Thecus new Dual-Port NICs, the C10GI540T2 and C10GTR). Even if a NAS in a storage compound goes offline, data will still be available due to an intelligent deep algorithm that distributes copies of the data across the devices automatically, users are able to nominate how many replicas of the data are created. Through this, Scale-Out offers high levels of redundancy and security that is similar to a RAID system for most business applications while being easier to maintain and expand. Expansion using the Thecus Scale-out function can be as minimal as to use only a single disk or as extensive as adding several NAS devices to a Scale-Out storage compound, easily and without service interruption. The scale-out system is able to work and repair itself smartly through Auto Management features. For example should any storage “brick” from a volume group be damaged, the system has the capability to automatically use an unused brick to repair it. This allows for a reduction in time needed for maintenance and increased reliability. With use of Scale-Out, businesses can avoid costly revamps from scratch to their data centers by simply adding additional NAS devices. The initial expenditure can be more modest, as management will not have to purchase a large new unit while minimizing any disruptions through the upgrade process. With more foreseeable cash flows for data storage expansion, business can utilize freed up cash for other critical business projects and prioritize expenditures more flexibly. When a NAS or HDD is added, the individual nodes will be configured and added to a storage pool. As you add NAS to the environment, the nodes are automatically added and configured. For more information on our10 GbE expansion NIC cards, please investigate the C10GI540T2 and C10GTR. For more information on products with native 10gbe support, please investigate the N7770-10G and the N8880U-10G.